It really is hard to believe that Amara turned 12 years old two weeks ago! Her birthday celebrating started with presents, cake and ice cream at our house. Grampy celebrated his birthday recently, too and as a gift for both of them I made a Shutterfly Book entitled “Amara and Grandpa 2004-2015”. The book turned out amazing but it was a lot of work! I went through all of my thousands and thousands of pictures looking for the perfect ones from each year. Photos of just the two of them. While that narrowed it down a lot, I still had a couple of years with over 50 pictures. I had decided to make the book 22 pages long — 2 pages for each year. I didn’t think I would ever get the photos down to a manageable number but I did and the book really turned out great! Finally! Because it took so long to finish Grandpa got his a couple weeks late and Amara knew nothing about it. We also got her two soap making kits and I am hoping she will bring one of them back on one of her future sleepovers so that I can watch her make them. The real partying started on Saturday afternoon! 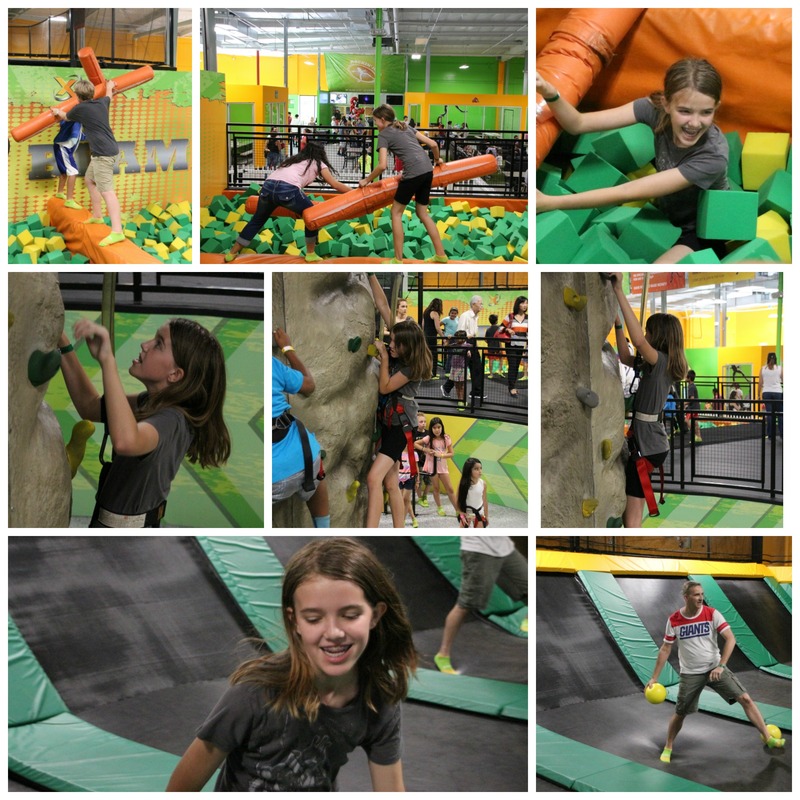 Amara had invited 3 girls and 2 boys to join her for a party at Rockin Jump where we had the Mother and Son Event. This would be followed up by a pizza party and around 10 PM the boys would be picked up and the girls would spend the night. I went to take pictures, as Jenna and Justin would be busy jumping, too! Justin had so much fun playing dodge ball with kids on the trampolines and he showed them no mercy! Amara looked so athletic climbing the rock wall and they all had fun in the jousting pit. Jenna refused to joust – she’d seen how hard it was to crawl out of that foam filled pit! It got scary for a moment when one of the girls lost their glasses in the pit! I not only went to take pictures but as transportation to help get all the kids back to Amara’s for pizza and lots of shenanigans! I had the biggest car so I got Amara and the girls. Best part of the ride home was listening to the girls laugh at a Donald Trump video! I am just amazed at how politically aware they are! Sunday morning was the annual Orbeez War and the boys and I were coming back for that! Jenna and Justin had made a huge tub full of Orbeez and their lawn looked amazing when it was all done. Much like Amara, Fred, and the fake snow every Christmas, I hope these kids never outgrow the Orbeez Wars. I know Justin never will! He is still the girls’ favorite target and much like the dodge ball, he shows them no mercy! He even comes dressed for battle! FYI — Amara filled her cap with Orbeez so that she wouldn’t have to keep going back for more! Amara had a wonderful birthday! I can’t wait to see what the next year and OCSA will bring for our girl! This memory was posted in Special Occasions and tagged Amara, birthday, Orbeez, Rockin' Jump on May 8, 2016 by Grandma Kc. The book is fantastic!! Thanks for all the hard work in putting it together. It’s wonderful to be able to hold onto those years in ways that our parents and especially grandparents couldn’t. This is so sweet! What fun the two of them – Amara and grampy – will have paging through that wonderful book year after year. Priceless! Age 12 is the perfect time for the crazy fun of a play house. I just love how Justin – and you and Jenna – join right in with all of the activities. I enjoyed seeing the pictures. We have similar places but I’ve not seen one with rock wall and a jousting pit. And Orbeez Wars? Go Amara! GET THEM! Happy Birthday, Amara! You get more beautiful and more precious every year! I know that photo book was a labor of love. Such a happy day by the looks! Happy 12th Birthday Amara!! Wow! She is looking more and more grown up. What a fun birthday! 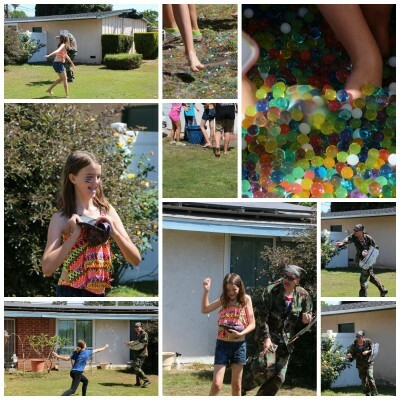 The jump place looks like a blast and of course you can’t beat a tradition with the Orbeez Wars..what fun parents and grandparents 🙂 Are Orbeez water beads? Can’t wait to read all about next school year too! 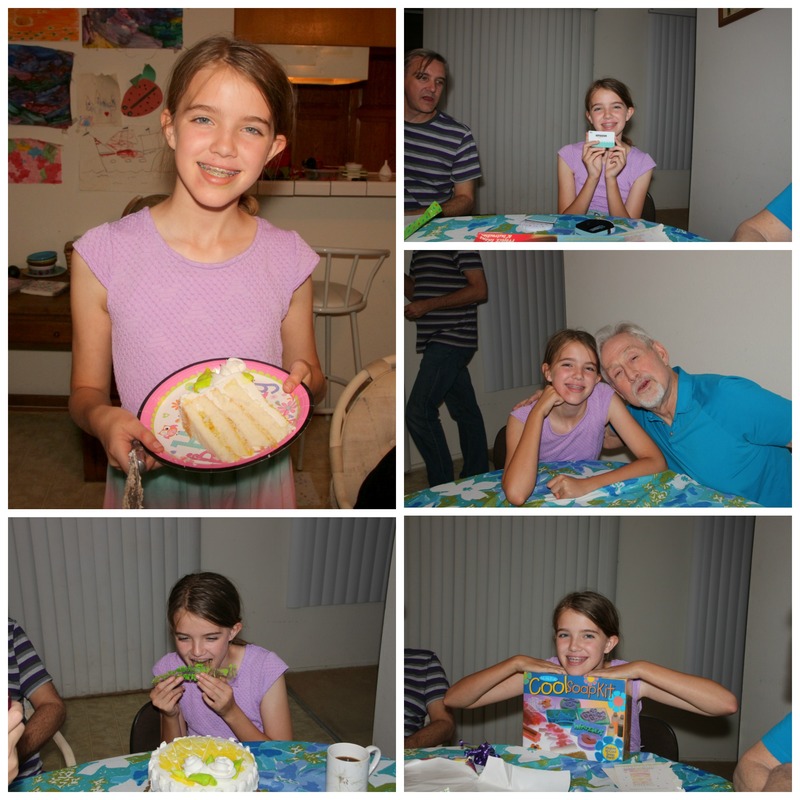 It sounds like Amara had the perfect celebration for her 12th birthday! A nice blend of new things along with the great tradition of an Orbeez war! Happy (belated) birthday to Amara! She has grown into such a lovely young woman! Again, cheers to Amara on turning TWELVE! Oh my goodness. How time flies. And I feel older now. Haha. The party looks amazing !!! So much FUN! What a weekend party! Sounds like such a variety of fun events and she looked so happy in all of the pictures. I LOVE the book you did from Shutterfly. I bet you truly did have thousands of pictures to go through. Happy Birthday Amara. Yes, it will be interesting to see what the next year brings for her and your family. You have my sympathy on the books. I love making them, but making the choices, oh my, so hard. My goodness, twelve. Love to see that little kid fun is still happening for her ( and the rest of you). My oldest turns 16 in less than a month! Two more school years, then she’s off to college. Amara looks like she’s having a great time at her birthday celebrations! Happy 12th to her. What a great book you made. I’ve made several photo books over the years, and I know how much work they are. However, they’re keepsakes, and people love them. What a fun birthday! Sounds like the kids had a wonderful time. I bet they slept good that night. Happy birthday to Amara! It looks like she had a wonderful time! One more year until she’s a teen–wow! That book you made is sure to be treasured.